Cashflow and your Home Based Business. The whole concept of keeping track of your cashflow, making sure you have 'positive cash flow', may sound simple enough, however you’d be surprised as to how few really treat this with the respect it deserves – particularly home based business’s. This cashflow chart shows very simply where to start. Let’s look at a very simplified version on why this is so important to track. I often say to my children that the state of their ‘room’ is a reflection of their state of mind. Same goes for their cars – if they are unwashed, rubbish left inside it reflects their lack of appreciation for what they have. What you appreciate you get more of – this goes not only for ‘room’s’ and cars it is also true of relationships. Appreciate someone and you receive more then you give. Your attitude of gratitude for what you DO have will expand. If you leave a car in an un-kept way, what happens to the value of it? It looses value very fast particularly if it is left to rust and decay. Value what cash flow you DO have regardless of your ‘opinion’ of how ‘little’ or ‘not enough’ it maybe ‘cause what you value expands. Tracking makes you 'aware' Once you start to track the flow of your cash, you also become more ‘aware’ of how you could manage it or ‘control’ where it goes so it is for your highest good and will support you in where you want to be financially in the future. Your attitude of respect for successful money management will also help you recognise that you really DO deserve to have the financial success you crave. So often we hold ourselves back by unconsciously sabotaging ourselves with guilt about not being ‘worthy’ of financial success. Combine all of this together and you can move towards your goal. Tracking your money flow using a simple home booking system. Debt can be insidious. Here is a simple effective debt reduction plan. How to make a budget. Tithe – Follows a very simple concept of 'what you give away you get to keep'. Pay yourself first. Saving a small percent of all you earn before you pay others. Gives you control and choices as those fund grow. Are your expense’s more then the money coming in? Double your way to a million starting from zero. Ways to make extra money . 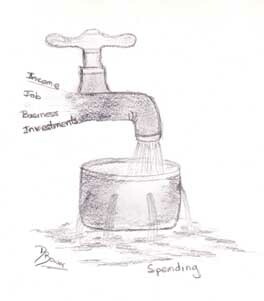 Creating cashflow while building a business – funded proposals. Overall, by managing your cashflow and building up a cash reserve will allow you to then take advantage of opportunities that come your way. Return from cashflow page to Home Based Business Home page.